Lorie Lenchyshyn knows her son will be taking home the cup as the champs from the Manitoba Junior Hockey League and the Saskatchewan Junior Hockey League face off. The question is: which son? Lorie Lenchyshyn knows her son will be taking home the cup. The question is: which son? 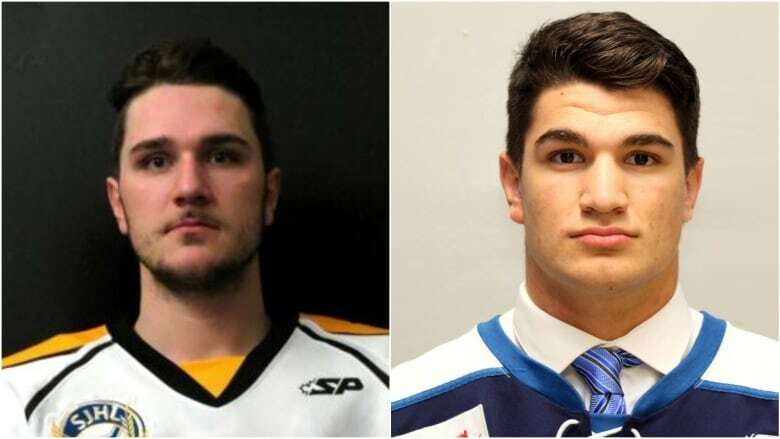 Steinbach brothers Thomas and Jack Lenchyshyn are both playing in the Canadian Junior Hockey League's western region finals. The series sees the top teams from the Manitoba Junior Hockey League and the Saskatchewan Junior Hockey League face off for the ANAVET Cup. The only thing: Thomas plays for Saskatchewan's Nipawin Hawks. Jack plays for Manitoba's Steinbach Pistons. "The two of them have been kind of chirping each other since Jack signed on with the Pistons last summer because they both knew they were going to pretty strong teams," said Lenchyshyn. "So the possibility of this happening, we had seeds of that earlier last year already." Thomas, who is 21, is nearing the end of his Junior A hockey career, while Jack, 18, is just starting and fighting for ice time, said Lenchyshyn. The rivalry has involved some good-natured teasing from Jack, Lenchyshyn said. "'Well, Thomas, I'm going to drop the gloves with you at centre ice,'" Lenchyshyn recalls her younger son saying. "And then they both looked at me and laughed. And I promptly said, 'Well, I'm sure a mother has gone on the ice and grabbed her kids by the ears and hauled them off before, so …'"
The brothers' rivalry began when they were toddlers, said Lenchyshyn, who called it a healthy, respectful and ultimately supportive competition. But playing against each other is something new for them, and certainly not something that's happened with these kinds of stakes attached. The winner heads to the Royal Bank Cup, the ultimate Junior A championship trophy with winning teams from across Canada competing. "There's three years difference between the two of them," said Lenchyshyn. "The only time in minor hockey where it [could] have happened would have been in midget. And by the time Jack hit midget, Thomas had already gone off to play junior hockey." Lenchyshyn called the entire season an "emotional roller coaster," since the Humboldt Broncos were on their way to play the Nipawin Hawks when the Broncos' bus crashed on April 6, killing 16 and injuring 13 more. "It really does impact so many people in so many different ways. And I think that, you know, for Thomas's team, for the Hawks, they have been through a lot. "I think there's … a lot of therapeutic value in just getting back to playing the game. And that was something that we saw in Thomas. After that first game, he was kind of ready to talk about a few things. Prior to that, he wasn't." Lenchyshyn praised the hockey community in rural Saskatchewan for stepping forward and offering support to the Hawks and the Broncos in the aftermath of that tragedy. "When you talk about hockey, and you talk about what it means to Canadians … it's way more than just a game." The Hawks beat the Pistons 4-3 in their first match Friday night in the best-of-seven series, but Lenchyshyn says she's is cheering for both her sons. "I say 'Any time you guys are on the ice, I am cheering for you.' So whoever's on the ice, I will be cheering for. I'm cheering for them both, equally." However, after the cup is won, she's expecting both her sons to do one thing immediately. "I'm expecting both boys to get haircuts and shaves, promptly."